All RGI programs are ethics-based. We teach ethics first, before anything else, and our ethic is the foundation of everything we do. The primary rule is that life is a universal value and must be respected and protected. Whose life? Self and others. Which others? All others. So, the universal life value is a dual-value—self and others. 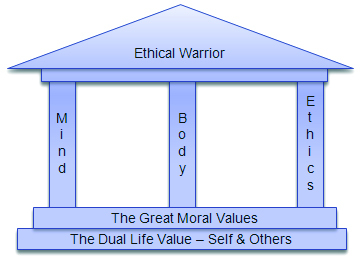 Moral values are relative values that protect life and support the Dual Life Value of self and others. The great moral values such as truth, freedom, charity, etc. have one thing in common—when they are functioning correctly, they are life-protecting or life-enhancing for all. But they are still relative values. Our relative moral values must be constantly examined to make sure that they are always performing their life-protecting mission. Dedication to protecting the Life Value of self and others—all others—differentiates the "good guys" from the "bad guys." Life is the "true north" of the moral compass. A calibrated compass helps us to more reliably navigate toward the ethical and away from actions that may be immoral and regrettable. Ethics are moral values in action. A person who knows the difference between right and wrong understands what is moral. A person whose morality is reflected in their willingness to do the right thing—even if it is hard or dangerous—is ethical. It starts in the school yard. Most everybody knows that the bully is wrong—that's morality. But only a few will speak up to protect the one getting bullied by calling for a teacher—that's ethical behavior. Even fewer will step in physically to actually protect the child being bullied—that's the behavior of an Ethical Warrior. It is important to articulate why it is important to be ethical (act morally). We have to be ethical, because morality protects life. Why Martial Arts, Defensive Tactics, Combatives? Ethics are ultimately moral-physical. Moral people may want to step up and do the right thing, but they often lack the physical courage and ability. Martial arts give them the necessary skills and confidence. Even if they never have to use it! 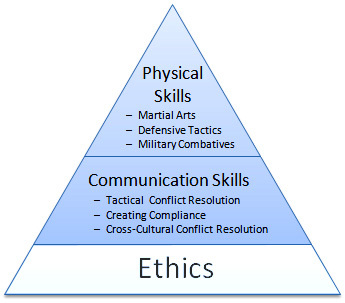 And that is why Ethical Warrior training includes—and must include—martial arts. It is also important that the martial arts training be ongoing. An interesting challenge with Ethical Warriorship is that it tends to "wear off" without sustainment. RGI Programs help sustain the warrior ethic through a program that includes regular physical-moral training. It is true that the difference between right and wrong, morality and immorality, is not often a matter of life and death. Sometimes it is just a matter of getting a reasonable balance of concern between self and others in order to live a good life and get the job done. Getting that good balance between self and others—and maintaining it through sustainment—is the ultimate philosophical goal of RGI training.